Great product, packaged well and delivered on time. Well packaged and good price. You supplied a new battery to me very quickly and with no difficulty. 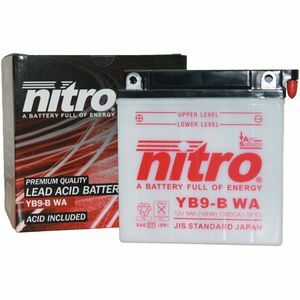 I chose this battery for my 1961 Royal enfield Crusader Sports as I am converting this to 12 volt electrics. I have not tried the installation yet. Great value..supwr fast delivery 5Star!!! Brilliant product, price and despatch/delivery time. Really good product, it came professionally packed with full clear instruction. Sales team were prompt with posting and there was full communication in the delivery process. You really can't ask for better. Thank you guys. All good. Website, delivery, instructions for filling and installation. Nuts included.